Why The 2014 Kia Optima Might Be The Right Choice For A 33 Year Old Who's Only Ever Driven Sporty Cars | OhGizmo! By David Ponce on 11/15/13 • Leave a comment! The following post is sponsored by Kia -Ed. There’s something strange about being a typical 33-year-old guy. It’s an age where you’re kind of stuck between two worlds. On the one hand, the memories of your 20’s are still fresh. I, for one, spent them driving cars that could have been described as sporty; I liked it when my vehicle at least looked like it might be able to go fast. These cars were two-door, sometimes two-seater affairs, and practicality never entered the equation. But on the other hand, you notice your life might be changing somewhat. You’re in a steady relationship and have been for a few years. You may or may not be married, but you’re starting to think about having kids. And you’ve already bought or are about to buy your first home. In short, you are now a full-fledged ‘grown up’, and the reality is pretty clear: it’s time for a new, more appropriate car. Here’s the thing though: you’re not quite ready. You want a compromise, something that harkens back to your youth while accepting the realities of adulthood. And I think the 2014 Kia Optima fits that bill perfectly. Let me tell you why. While there’s social pressure not to be superficial in interpersonal relationships, the same doesn’t hold true to how one forms one’s judgments of cars. The way your ride looks counts for a lot, and in the mind of this 33-year-old, it’s important my new car at least look sporty. And good. Not sensible and boring. And while they say beauty is in the eye of the beholder, there happens to be a growing consensus among reviewers that ever since Kia redesigned the Optima in 2011, the car has stood out from the other mid-size sedans on the market for its sporty and elegant appearance. Its athletic stance, raked lines, flashy wheel designs, and aggressive proportions come across as one of the better looking, and more importantly, sportier looking vehicles in its class. I agree. I love the way it looks and this was step one in having me consider it as a more “appropriate” car for me. Once you’re done looking at the car, you start thinking about how it’s going to drive. 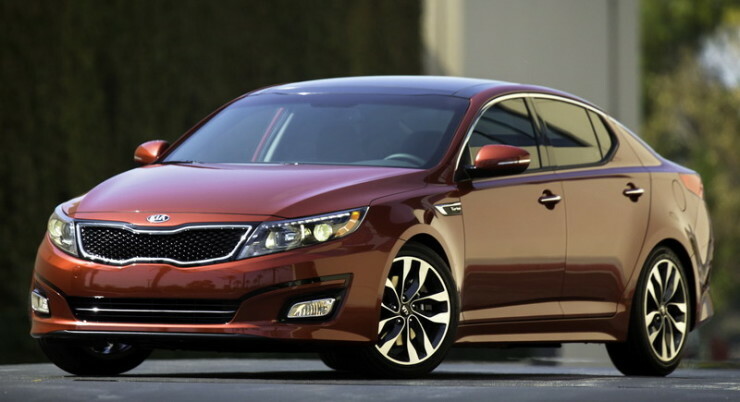 The 2014 Optima has a few drivetrain offerings, which should satisfy every taste. While someone else may be happy with the standard 200-horsepower, 2.4-liter four-cylinder engine with direct injection engine, or the hybrid 199 hp (combined power) and 235 lb-ft (combined torque) solution of the Optima Hybrid, I have my eye on what’s powering the Optima SX. It’s a turbocharged 4-cylinder engine cranking out 274 hp and 269 lb-ft of torque. That should be more than enough to satiate those lingering performance cravings. This, combined with a sufficiently stiff suspension and selectable drive modes that firm up the steering response and move the transmission shift points, should make for a lively ride that still feels sporty. If you’re going to be having a family, number one on your priorities list is to keep them safe. Sporty performance and athletic looks mean nothing if the occupants the vehicle carries are not likely to survive an accident. The 2014 Optima earns 5-stars on all safety tests by the federal government, as well as a Top Safety Pick+ from the insurance industry funded IIHS. With optional safety features like Blind Spot Detection, Hill Assist, Brake Assist, and front seat-mounted side airbags and side-curtain bags, this car should do an excellent job of protecting life and limb. Finally, once you’ve decided you like the way it looks, you like its performance and you feel safe driving it, you have to turn your attention to the interior. It is, after all, where you’ll be spending most of your time with the car. I’ve reviewed the Optima’s UVO system previously, but as a reminder, this infotainment system gives you access to your media, and displays your incoming texts on its screen so you don’t get the temptation to touch your phone while driving. It also has a pretty cool “virtual CD carousel” that lets you rip your CDs and shuffle between 5 of them without the plastic discs being physically present in the car. I like it a lot, and for more details on it I suggest clicking that link above. So that’s basically why I’d seriously consider the 2014 Kia Optima at 33. There are quite a few offerings in that class of vehicle, but the Optima stands out for me. It’s a beautiful, sporty looking car with commendable performance and high standards of safety, that will take me and my eventual family around safely. That’s really all someone like me could ask for.